Magento 2 Refund Request by Customer extension allows customers to submit a refund request on the Customer Account Page. Magento 2 Refund Request by Customer extension helps speed up the refund process by enabling buyers to send their requirement via a refund request popup. 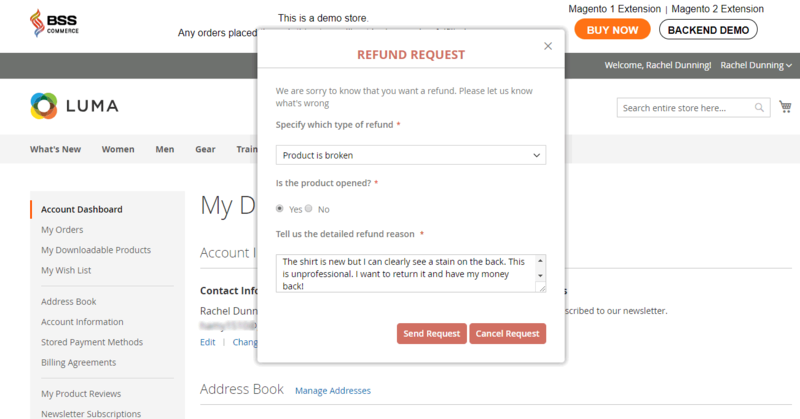 In Magento 2 Refund Request By Customer extension, after logging in My Account, customers can locate the order, click the Refund Request button and state the reason for request in a convenient return order popup form. For more details of refund request, Magento 2 Refund Request by Customers extension supports customizing refund confirmation popup. Admin can add the title, description of popup and text input field for customer comments. All refund inquiries from customers are stored in refund request grid for convenient management. 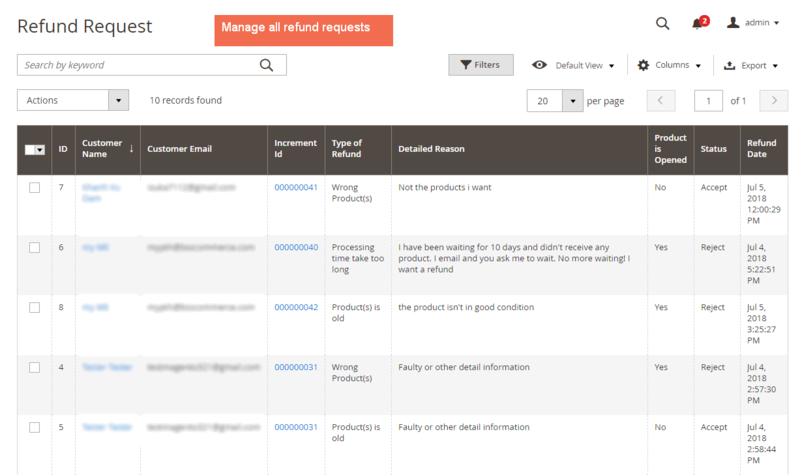 Magento 2 Refund Request by Customer grid consists of order information, the reason of return orders, and refund status (Accept, Reject) for admin to process the refund requests. 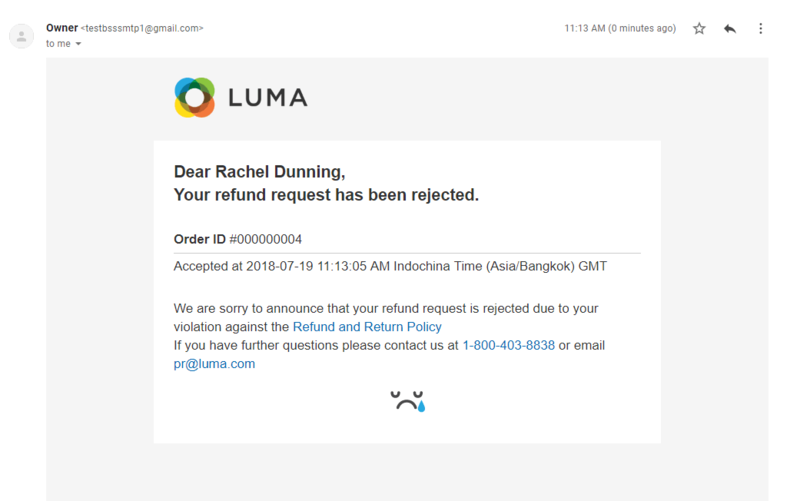 Both admins and customers receive notification emails of refund request updates. 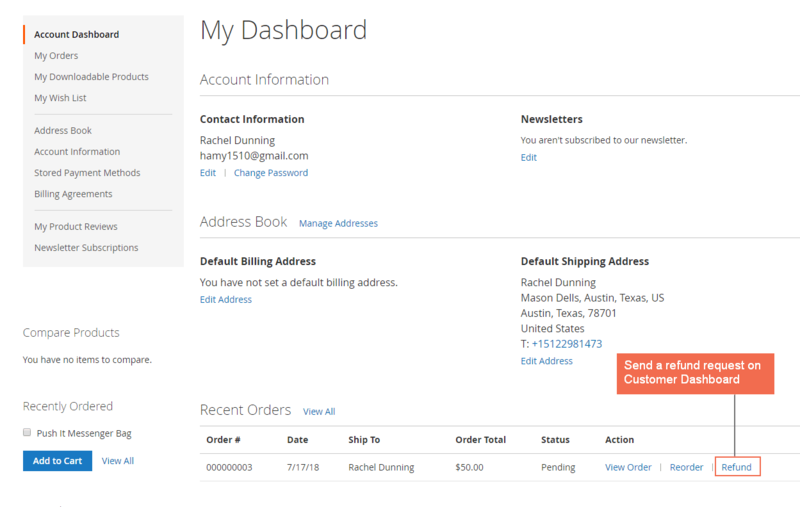 Using Magento 2 Refund Request by Customer extension, admin can select sender, receiver, and template of emails. Why Is Magento 2 Refund Request Your Must-Have Extension? Refund Request by Customer extension for Magento 2 is beyond any doubt your essential module. Magento 2 Refund Request extension improves customer experience by allowing them to send request to return and refund orders. Customers often develop more trust in stores that offer flexible refund policies. Taking refund requests into consideration can definitely increase customers’ satisfaction and positively promote store sales. Magento 2 Refund Request by Customer extension save store owners tons of time because all required details of the request are available at their fingertips. Not only can admins obtain general information of the order (Customer name, Order ID, Order date), but they also get to know the reason why customers ask for refund. As a result, owners produce proper actions to either accept or reject the request in the same grid of Magento 2 Refund Request extension. Refund and order return is an absolute down point for any ecommerce business, but this is a necessary feature that Magento default still lack. So I decide to implement the refund function for customers. The customers have more trust in my business and the refund process is much smoother. I buy the refund request extension and store credit extension from BSS. Good combination!